Liverpool is still one of the most deprived cities in the UK, but it does have an economy that is slowly improving. Only last week, it jumped to fifth place in the table of cities most-visited from overseas. The 1,000 new jobs at the Jaguar Land Rover plant in Halewood are another welcome boost. Yet the fact that some 35,000 people applied for those vacancies shows how it still has a long way to go. This is why ambitious projects like Liverpool Waters, the controversial plan for new offices, homes and other facilities around decaying northern dockland, are important. The biggest planning application ever submitted in Britain, seems on a fantastically inhuman scale which naturally makes people uneasy, including The Observer‘s London-based Rowan Moore; but sometimes, especially when you’re at the bottom, you have to think big. When Liverpool’s early leaders built the world’s first enclosed wet dock, which opened in 1715, they mortgaged their entire modestly sized town to build it. It was a big risk that paid off; so was Liverpool’s pioneering of the world’s first intercity railway, to Manchester, in the face of many who said that it would never work. Such risk-taking helped to build Liverpool, but it is something we seem to have lost over the last forty years. There has also been a knee-jerk reaction against Liverpool Waters as a scheme of that instinctively mistrusted group, property developers, in this case Peel Holdings. This can be justified, as more often than not such organisations focus on profit above all else. Yet if property development for profit had never happened here, the historic docks that we now admire would have never been built. The Grade 1-listed Albert Dock was not built to look nice. It was built to make money as a fireproof shed, that in 1846 was starkly modern and was criticised at the time by local historian J.A. Picton for its brutal mediocrity. Today’s aggressive heritage lobby and aesthete critics are fond of proclaiming Liverpool’s past innovations and achievements, with the hindsight which Reilly could not have. But they are as blinkered as he could be to the city’s need to continue to innovate and develop. The threatened loss of the UNESCO World Heritage status which covers part of the site, if the development goes ahead, would be a huge blow. However, the pluses and minuses of having the status are hard to quantify. Dresden in Germany also lost its World Heritage Site status when it built an important modern bridge, yet remains a tourist magnet. Meanwhile such critics seem content to oppose Liverpool Waters without offering any realistic alternative plan for this huge area, not even a notional one. That would condemn the historic structures in the northern docks to continue to rot for want of money or a reason for being. Nearly all these old buildings would be restored as part of Liverpool Waters, alongside the new developments. I believe that the Waters should be compared to Liverpool 1, the new shopping and leisure area developed by the Grosvenor Estate and opened four years ago. It too was heavily criticised during construction, but vox pop on its streets today and you would find few who would want to go back to the 1970s Moat House hotel, the wasteland car parks, concrete Paradise Street Bus station and the Argos Superstore that used to stand there. Liverpool 1 created thousands of jobs and helped the city to leap from 14th to 5th in the UK’s retail rankings, while not, as many predicted, destroying the traditional shopping areas of Church Street and Bold Street. It has also attracted dozens of new shops to Liverpool at a time when town centres nationally are collapsing, the development creating the demand. I didn’t like Liverpool 1 while it was in gestation, but now I find it hard to argue now against its success in transforming Liverpool’s town centre for the better. The northern docks, though, are an even bigger challenge. Yes Liverpool could do something smaller with them. Something mediocre like the call centres and car showrooms that line the former southern docks up to Otterspool, or the city could really think big, something equivalent to the scale of ambition Liverpool once had. For all the genuine fears of ‘more Yuppy flats’ the Peel plan does have an economic basis. 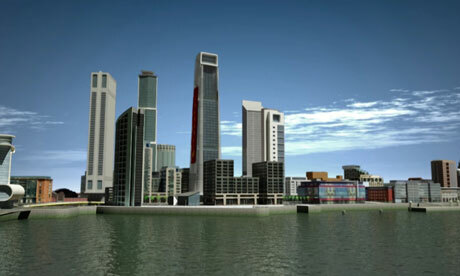 Their schemes for regenerating the Wirral docks with ‘Wirral Waters’ will be based on a new International Trade Centre in Birkenhead, the first of its kind in Europe, which has already attracted firm Chinese investment. The plans for Liverpool Waters meanwhile, are linked with the new ‘post-panamax’ shipping terminal that will be able to handle the world’s largest ships. These ‘concrete’ bits of economic development, unglamorous as they are, are going in before any of the proposed shiny towers. Peel also has an enviable track record. They built the Trafford Centre, which employs 10,000 people and, contrary to what people said at the time, didn’t destroy Manchester city centre. They have also turned Liverpool Airport from a joke to the 10th biggest in the country and, their biggest coup of all, got the BBC to move north to MediaCity:UK in Salford, which has created thousands of those ‘good jobs’ in the north, with the prospects of thousands more to follow. There has been some criticism that many of these people have transferred from London, but that doesn’t account for the fact the BBC were hardly going to lay off their existing staff en-masse and ignores the prospects for future generations in the north once the BBC has settled in. People are understandably also sceptical of the timescale proposed for the plans for Liverpool and Wirral Waters, 30 years. Yet when the re-development of the defunct Salford Docks began in 1983, if you had said then that, 30 years later, MediaCity:UK would be there, you’d be laughed out the room. Now though, we can all tune into BBC Breakfast News live from the banks of the Manchester Ship Canal. I’m not Peel’s PR. They have some questionable business arrangements, tend to rely heavily on outside investment and often build dull architecture; but again I turn to the critics and ask: what else do you suggest? No one else has any workable plans for the northern docks. So do we go for it? Or do we forgo the risk, let Liverpool’s economy struggle along and allow a historic part of our city to rot indefinitely while wistfully hoping for something else? Even as a supporter of the Liverpool Waters plans, I admit that I will believe it all when I see it. But I never would have believed the developments that have already happened in contemporary Liverpool were possible a few years ago. The city and the Government should take a leaf out of our history and go for it. Critics should meanwhile put pen to paper to show us they think could go in its place. This is an extended version of a piece that appeared in The Guardian in May 2012.